In Fairy Dust, fairy twins Claudine and Claude hire Sookie to find out who killed their triplet, Claudette. Sookie's got a bad feeling about this but is determined to bring the twins closure. In Dracula Night, Eric is throwing a birthday party at his bar Fangtasia. It's Dracula's birthday and Eric is hoping that Dracula himself will make an appearance. Vampires only celebrate two holidays, Halloween and Dracula's birthday. Sookie is invited, but with a room full of vamps and Dracula on the way, it's going to be hard to keep her off the dinner menu. One Word Answer, Sookie gets some unsettling news concerning her long lost cousin, Hadley. Just when she thinks life couldn't get any weirder, she finds herself drawn further into the vampire world. What is there to do in Bon Temps with no mystery to solve? In Lucky, Sookie must help her insurance agent uncover some strange happenings with his business. Gift Wrap finds Sookie alone for the holidays but gets a very unexpected holiday surprise in the form of a naked man. I picked up this book of short stories about Sookie Stackhouse thinking it was new material. 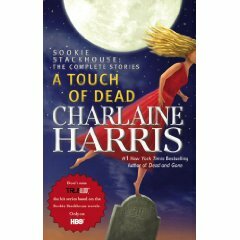 It wasn't but I still love me some Sookie Stackhouse so I read it anyway. I had already read most of these stories because they were included in other anthologies. I did enjoy rereading them since we won't be hearing anything from the Bon Temps gang until next summer. I love Sookie too. Can't wait for True Blood or a new novel to come out. In the meantime,if you're looking for something new to read, you need to try J R Ward's Black Dagger Brotherhood novels. You will not be disappointed.